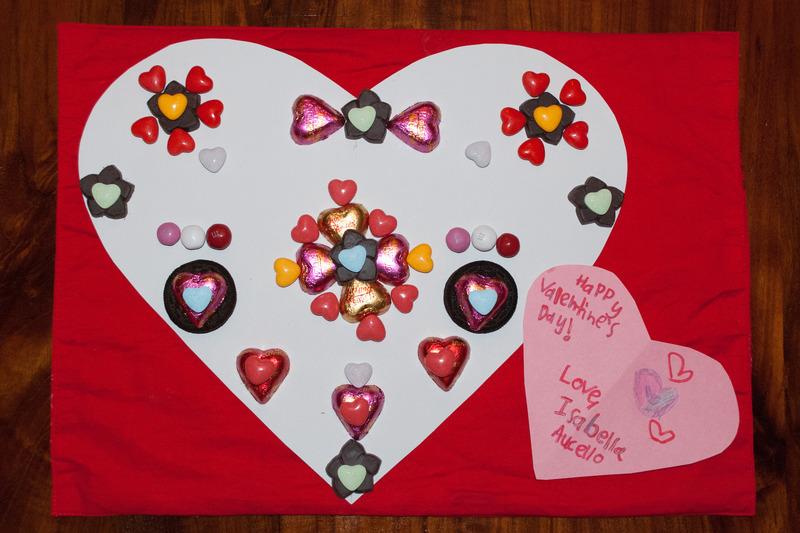 When Isabella was 3 her preschool teachers asked the children to make homemade Valentines for their class members. I knew Isabella would enjoy creating the first few but would not stick around to make 16. I decided to let her make one wonderful creation. I set red, purple, pink and white paints out and let her go to town. 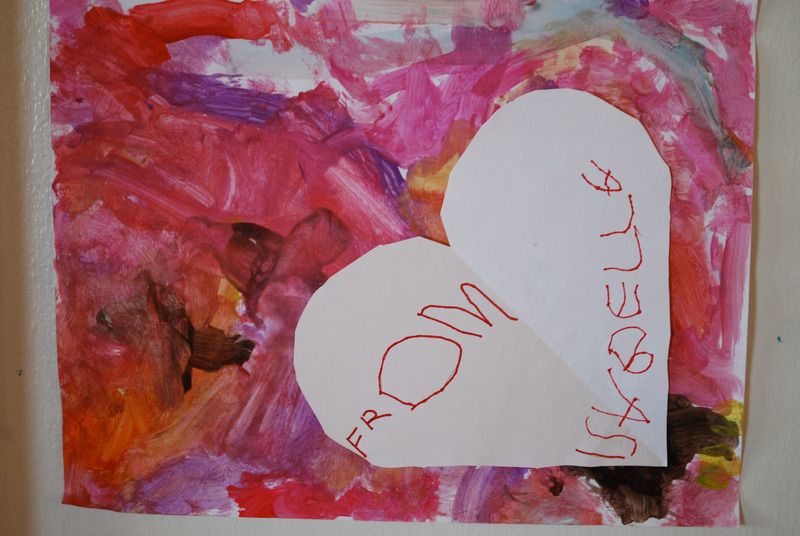 I traced a heart, had Isabella cut it out, and had her write “from Isabella” on it. I took a photo and had multiple copies made. All she had to do was help address the envelopes. 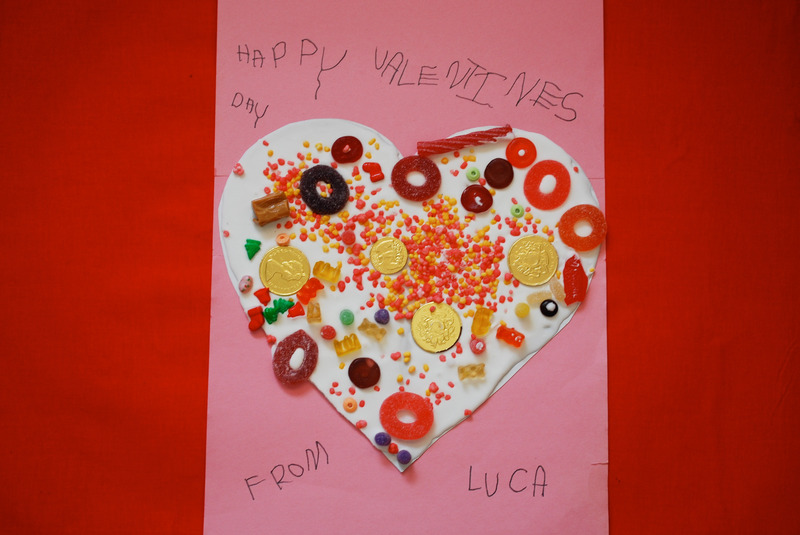 Voila, easy homemade Valentines from a 3 year old! We’ve continued the tradition these last few years but changed the materials from paint to candy. I believe it initially happened by accident, a result of a lot of Christmas candy lying around. The kids always have fun working with the “forbidden fruit” and have asked to do it again this year. 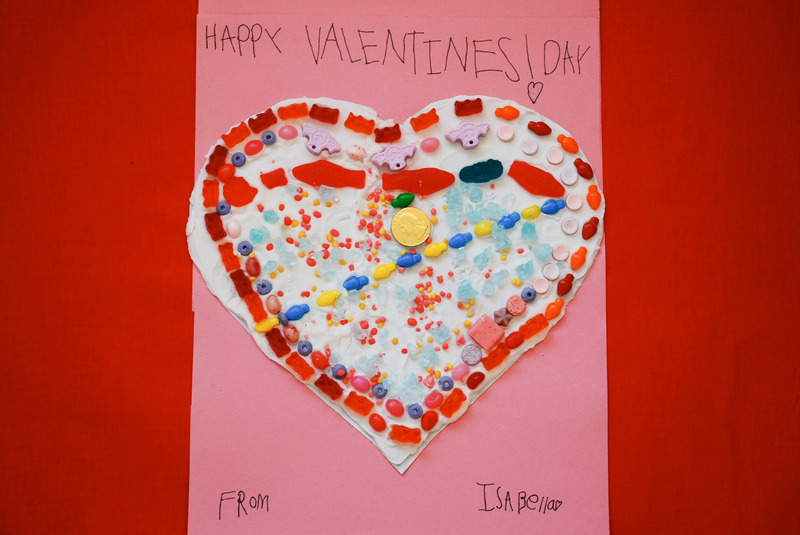 Older kids can draw and cut out their own heart from construction paper. Younger children might need your assistance. Place the heart on a different colored piece of construction paper. We use red placemats, which seem to be the perfect size. 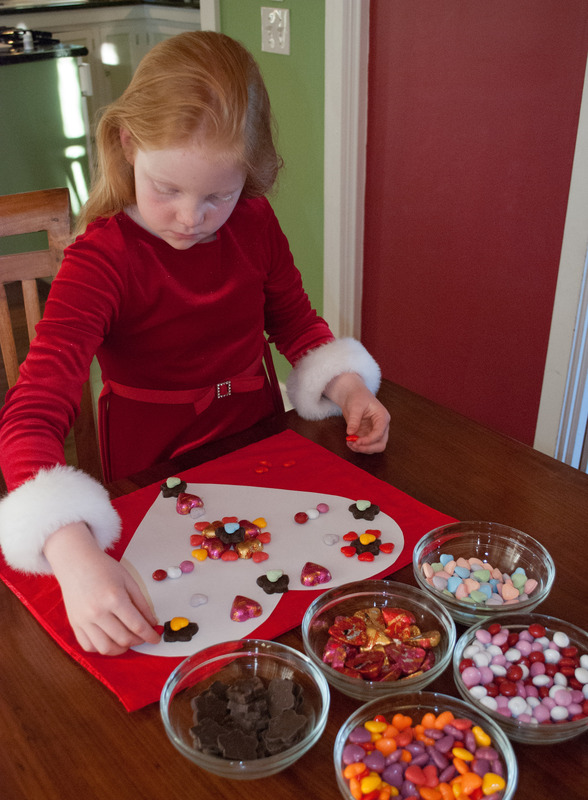 Let the kids use candy to decorate their Valentine heart. No need to glue them down. Have them write “Happy Valentine’s Day from ‘your child’s name here’” on this or another piece of paper. Alternatively, they can glue the finished photo onto a card or paper and write their name there. 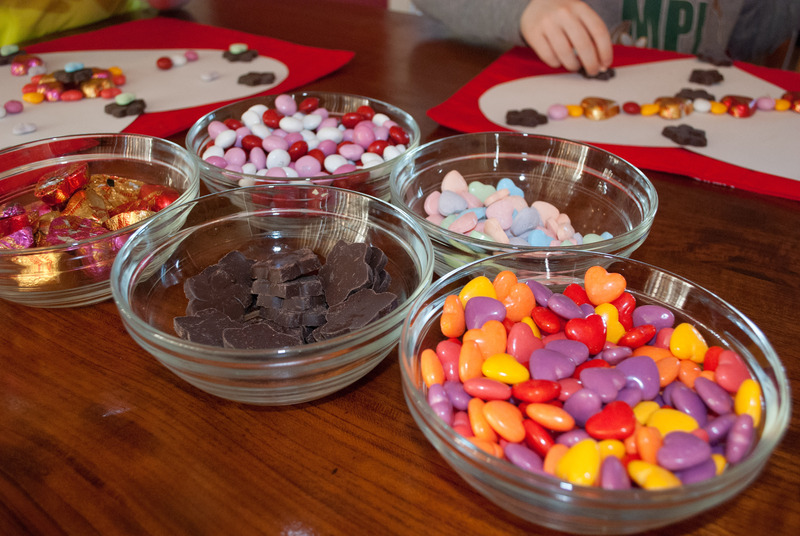 Take a photo of the candy creation, print copies at home or at your local photo center. Have your kids slip the photos in envelopes and address them to their classmates. Before moving the artwork, take a look at the photos on your camera/computer. My daughter initially wrote in pink and we could not read the words so we had her trace them with marker. It’s a good idea to have enough extra room around the edges in case the photo gets cropped. It’s easier to trim a bit at home than to find out that your proportions were off and your Valentines are all cut off. 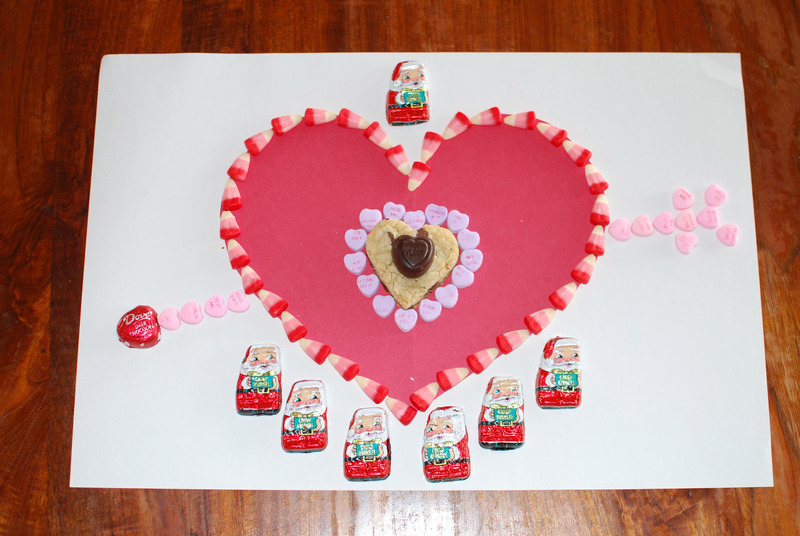 If you are cool with mess, let your child spread frosting on the heart and add candy and SPRINKLES! This entry was posted on January 18, 2013 by mdaucello in Crafts, Crafts, Holidays.